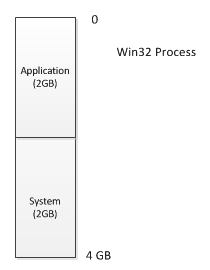 In 32-bit versions of Windows, a process has access to at most 4GB of virtual memory. Of this, an application can access at most 2GB. The remaining 2GB is reserved for the operating system. The 4GB limit comes from the fact that 32-bit words are used as addresses into memory, resulting in a maximum of 4,294,967,296 bytes–or 4GB. 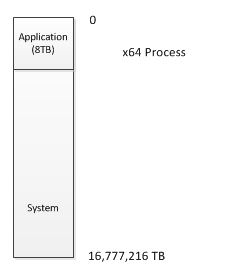 In 64-bit versions of Windows (x64), we get a 64-bit address space, resulting in 18,446,744,073,709,551,616 possible memory locations, or 16 exabytes (equivalent to 16,777,216 terabytes, or 17,179,869,184 GB). An application running on 64-bit Windows, however, only gets access to a tiny fraction of the available total. Each application can address a maximum of 8TB (or 8,192GB, which is still 4,096 times what a 32-bit app has access to).